Ed and Zelda are back for the first time this spring! Zelda still looks about the same, but Ed - oh my how he's grown! You can't really tell how big he is from a photo, but he was by far the biggest mallard I've ever seen. I wondered if he was half goose, or some other breed of duck that looks just like a mallard but is much larger. They like to hang out in the swale and eat whatever swims or floats around in there. Since our neighbor's weeping willow came down in January 2008, parts of the swale are wet all year, while part of it fills only after a heavy rain, and sometimes it looks more like a creek - even has a current. I enjoy watching the suburban wildlife who visit our backyard 'water feature,' sustaining themselves with the constant supply of food and water. With water there year 'round, I'm surprised we don't have more mosquitoes than we do in the summer. The bats seem to do a pretty good job keeping the mosquito population down, and I suspect the larvae also become food for some of the creatures who lunch at the swale. Awhile back I received an email from Dave at Garden Shoes Online with a $50 gift certificate to introduce their company. They hoped I'd blog about my experience if I decided to place an order, but there was no pressure. I'd never heard of them and thought about it for a few days. I decided to check out their website, and found they have more than garden shoes. I loved their hats, and their line of ergonomic garden tools looked very sturdy. I decided to give them a try. I invited them to become sponsors of Spring Fling, and it turned out they were already in contact with Mr.Brown Thumb about that. Since then they've become a sponsor, and several lucky garden bloggers will be recipients of Garden Shoes Online gift certificate door prizes. That's great Dave! Thanks so much. By the way, I LOVE my new hat! It may be coming with me to Spring Fling to keep the sun off my head and face. I received my order the same day as a plant order from White Flower Farms, and I've already used the transplanter tool to get my new plants in the ground. I love that too, and I think it will become one of my favorite garden tools. It's so comfortable and sturdy, the long scoop works better than a trowel, and is great for when a shovel or spade would be overkill. It's my first ergonomic garden tool, and now that I know how much more comfortable it is to use than a traditional style garden tool, it won't be the last. Thanks again for the introduction to your company and for your sponsorship of Garden Bloggers' Spring Fling in Chicago. Speaking of Spring Fling, there are still lots of seats available for Saturday's bus. If you're attending Spring Fling please be sure to register for the bus asap. The bus will give us the opportunity to travel together, enjoy each other's company, assure we get to where we need to be on time, and make travel easier on the most logistically-complicated day of the Fling. With a Cub's game at Wrigley Field on Saturday, you'll avoid the stress of driving from place to place in heavy traffic in an unfamiliar city or taking multiple trips on public transportation. You can register and pay for your seat on the bus here. Except for Bloom Day posts over the winter, I haven't updated what's been happening in the basement. Most of the winter I did little except water. I've been a little busier playing down there now that spring's here. I've read it's not easy overwintering hydrangea cuttings, although nowhere I googled really explained why. I suspect it might have something to do with their dormancy needs. The only one that thrived in the basement over the winter was Nikko Blue. Dark green and healthy all winter, I removed a number of buds and blooms so it would focus it's growth on roots and foliage. It's now planted out in a protected spot where it will be kept evenly moist from where the sump pump ejects, not far from where a new Oakleaf hydrangea went in last week. Both appear happy in their new home. The tubing from the sump pump has nail holes poked into it along the bottom side so it keeps a good-sized area nicely moist but not wet. I hope it will prove a good spot for a few moisture-loving hydrangeas. It's a very well-sheltered spot too, which I think they'll like over the winter. This one is also the healthiest of it's variety. It's amazing to me as tiny as they are, they too are budding. This one and three others are chlorotic and have been given some acid fertilizer. Hopefully they make it. Amazingly this tiny, anemic hydrangea is budding as well. Annabelle has been least happy in the basement. One that I planted out last weekend already has been chewed to the ground by something, probably a dastardly rabbit. I think I'll wait to put the others out when more is up and green for them to chew on, and hope they confine themselves to the lawn. Liquid fence is my friend and I may get out there with it in the next day or two (if the rain ever stops.) The bunnies seem to be ravenous and have been wreaking plenty of havoc, even eating hellebore blooms. It's probably pregnant females nourishing more spawn to eat more garden. They probably noticed the new veggie bed and are getting ready to enjoy the free salad bar with the kids. Double impatiens cuttings were started in January and the largest is budding. Several susceptible plants in the basement were attacked by spider mites including these and the hydrangeas. I think they hitched a ride inside on some once-gorgeous sweet potato vines - I've read that spider mites are a problem on them indoors. Live and learn - I won't be overwintering them next year unless it's just the tubers. Fortunately I think the mites are under control now. I did a lot of showering of foliage and wiping of larger leaves and plant stems. I even resorted to an organic pesticide to save a few of the worst-infested plants. I hated to do it - organic or not I never use pesticides. You can see the mites even went after the impatiens, but they're recovering and looking good in spite of the attack. I overwatered the Christmas cactus and it rotted. Before it was completely lost I rooted cuttings, and they're doing fine. Off to the right, you can barely see some veggie seedlings. There are several varieties of peppers and tomatoes growing happily under my industrial-strength light. Since the light is so powerful they're growing fine even down on the floor. This is a gardenia with sentimental value. It was a gift from the Lawn Man when were dating. I knew it was pot bound and tried to get it out to repot it, but it was stuck so I gave up. Over the winter, the roots were rotting and my once-beautiful gardenia was dying. I performed surgery, cutting it out of the pot. I found the drain holes were blocked and the soil was sodden. It really looked dead, but I didn't give up on it. I pruned the roots and branches and repotted it. A month later, the patient is slowly recovering. It's a shadow of it's former self but I'm glad it survived. The new growth is glossy and green. I've never tried starting cucumbers and squash early, following conventional wisdom to direct-sow the seeds. But it's fun to experiment so I've got a few of them started. Here's a Kuri squash that's outgrown it's original peat plug. It's in a 4 1/2" pot now. I'll bump them up as needed, and compare their performance with the ones I'll direct-sow later this spring. Experimenting is part of the fun of gardening! There are five hanging baskets overwintering in the basement. All the plants were removed, cut back, and root-pruned a few weeks ago. Reducing their size will help insure the baskets don't dry out too much between waterings over the summer. Everything was replaced into the baskets after renewing the soil and adding some mushroom compost. I killed the variegated begonia over the winter - probably too much water, but it paid off overwintering it the first year and was beautiful last summer. I'd like to find another one - they're great in baskets and very tolerant of dry soil. The sixth hanging basket was my beautiful fuchsia. Another casualty, it may have succumbed to the spider mites. We've had a hanging-basket fuchsia all five years I've lived here. The last one overwintered happily in the basement last year, but I wasn't so lucky this time. There WILL be another this spring - they bring hummingbirds to the patio and I'm determined to capture them on film this summer. They love the fuchsias. The garden attracts them too, but I like them up-close-and-personal on the patio. They tease me by flying off if I make a move for the camera. If I sit perfectly still they'll entertain me for quite a while as they're enjoying the fuchsia's nectar. This brugmansia will be a pass-along to Mom. I saw and smelled my first brug growing wild in Mom's garden the first summer after they moved to their zone 4 home around fifteen years ago. It must have grown from a seed. The previous owner was an avid gardener. Mom enjoyed that brug while it lasted that summer. A potted one can be easily overwintered. I think she'll enjoy this seedling from one of my brugs. I'd have dozens of brugs if I had enough sun, especially if I lived somewhere they were hardy. I can't wait until mine are back outside and blooming. They're beautiful and their heavenly scent is addictive. There are a bunch of double impatiens started from cuttings here, (seedling veggies are to the left, blackberries and raspberries to the right. The berries weren't propagated - they were actually purchased(!) but it was too chilly to plant them out before now since they're already leafed out. It should be ok to get them out there shortly. I've been pinching the flowers and will do that for the next two years to give the plants time to concentrate on maturing before fruiting. There's lots more in the basement waiting for warm weather - willow cuttings, lemon balm, elephant ears, geraniums, Diamond Frost euphorbia, caladiums, iresine, Persian shield, ornamental oxalis, begonias and others, and that doesn't include the plants overwintering in sunny windows in our living and dining rooms. I enjoy playing with plants in the basement over the winter, and am thrilled at the start the veggie seedlings are getting. I wasn't sure how they'd like the light, but they seem to be doing fine even all the way down on the floor. I hope you enjoyed the basement update. I'll be enjoying the fruits and vegetables of my labors and the money saved by keeping lots of tender plants safe over the winter. In spite of the spider mites and a few losses this winter, overall, basement gardening adventures and experiments are proving fun and worthwhile! I received my order yesterday, and would like to provide some feedback and request assistance resolving a problem with the forsythia. When I received the box, it looked fine and undamaged. When I opened it I was disappointed with what I saw. I was surprised by the small size of the root balls, (ok, the forsythia was in a larger pot and had more substantial roots than the witch hazel,) and both shrubs were at the bottom of the 6' - 12" range in their descriptions on your website. I've attached photos so you can see what I found when I removed the plants from the box. Most of the tiny forsythia was broken off inside it's bag. I'm sure it wasn't me who broke it. Since the box was undamaged and it was well-protected by the straw, it seems unlikely it was broken during shipping. I assume it was either also broken before packing, or was handled too roughly during packing. As a garden blogger I've been reading a lot about witch hazels on blogs across the country this winter and early spring, and was happy to find an online nursery (where I could order a small one since they are pricey shrubs,) even if it was small and knowing they're slow growers. I was happy to see the large variety of shrubs you offer, as my garden is large and young and I'm only beginning to focus on adding more shrubs. I'm disappointed with my first experience with Girard Nurseries. The witch hazel, although smaller than I'd hoped, especially the root ball, in spite of the broken pot appears healthy and undamaged. It was fun to see that it's started blooming as well. (hopefully the dry soil and roots won't cause it to die, and of course it's been well-watered now.) The forsythia though, is a disappointment with most of the woody portion arriving broken off the tiny plant. Please consider sending me a undamaged forsythia to replace the one I received. Anyone else ever order from this nursery? If so what was your experience? I looked them up at Dave's Garden and the reviews were mixed, though mostly positive. Although the size of the plants was a bit of a disappointment, they were within the range claimed on the website. (barely, but they were.) The sizes of the plants and the root balls are mentioned in both negative and positive reviews. Update Saturday, May 18th: I spent the day downtown with Monica, Mr.Brown Thumb, and On the Shores of Lake Chicago seeing Macy's garden show again, Millennium Park, and Grant Park. When I got home, I'd received an response to my customer service email, and I'm happy to report I'll be receiving replacement shrubs! Sorry to hear of your disappointment and I can assure you that is a rare incident. Our reputation since 1946 has been of the highest quality. We most definitely replace your order at no charge and they will be shipped next week. Again, I apologize for the inconvenience. I'm happy I brought my problem to their attention and they acted so quickly to correct it. Any company can have an occasional issue like this, and their quick and satisfactory response means I won't rule out a future order. It must be a challenge shipping live plants - so many things can go wrong in the process. I still think they have a nice selection of shrubs, and I don't mind starting small with some of the shrubs I plan to add to our garden. 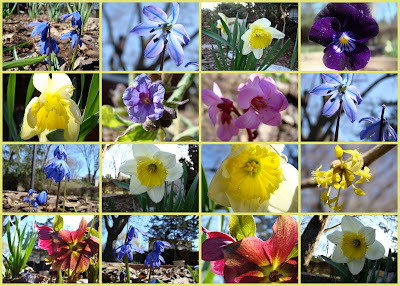 In the garden this Bloom Day are pansies, scilla, daffodils, hellebores, Cornelian cherry dogwoods, bergenia, and pulmonarias. The usual suspects are blooming indoors waiting for warmer weather just like me! Back to work at the greenhouse today - Monday was a cold, rainy day, so I got a reprieve. I took advantage of the day to work on my Master Gardener final exam and finalize a few more Spring Fling details. We've reserved a charter bus for SF Saturday events. If you're attending Spring Fling, please visit the event website for the latest news, including how to reserve your seat on Saturday's bus. Happy Bloom Day everyone, and thank you Carol at May Dreams Gardens for hosting Garden Bloggers Bloom Day. The local University of Illinois Extension office partners with Lake Katherine to provide a variety of volunteer opportunities including maintaining the gardens and grounds and conducting tours. Another wonderful public garden in the Chicago area, Lake Katherine is an easy commute from home, and a place where I hope to devote some MG volunteer hours. Tuesday our Master Gardener class visited Lake Katherine for a tour, orientation, and a pot-luck lunch social. The Heritage Garden at Lake Katherine is a large organic demonstration garden featuring a variety of fruits and vegetables. This was my first visit to Lake Katherine, although I've been hearing about it for years. It's still early in the season and not much is going on there yet, but we could tell in a few weeks this place will be beautiful. I love old rusty stuff, especially old farm equipment. This display is located near the Heritage Garden. It was a chilly, windy day, but we dressed warmly and enjoyed our tour. More old rusty stuff. I fell in love with the old wood stove. One of several sculptures at Lake Katherine carved from felled trees. The man-made waterfall aerates the water before it joins the lake, benefiting the ecosystem of the 20-acre man-made lake, including the resident beaver and swans. I'm looking forward to seeing the butterfly garden bloom. A view of the large herb garden. Lake Katherine offers a variety of programs for children and families, school and scouting groups. There are special events throughout the season, and the clubhouse at Lake Katherine is a popular venue for weddings and other special events. There are many lovely spots for wedding party photos. The indoor nature center is an educational spot for families and groups, with a variety of flora and fauna including snakes, rabbits, frogs, and a very cute and popular ferret who enjoys lots of naps in the hammock in his aquarium home. I hope to spend some of my volunteer time at Lake Katherine, and will share more photos from this beautiful spot as the season progresses. Are You Tired of Hearing About Spring Fling Yet? Last Friday Mr.Brown Thumb, Gina from My Skinny Garden, and I met for a private tour of Macy's State Street store's Garden Show taking place now through April 19th. Mr.Brown Thumb and I were able to spend the rest of the afternoon downtown. We thought Spring Fling participants might enjoy coming along with us on our walk to see what we saw after Gina headed back to work for the afternoon. Steps away from Club Quarters Hotel, this might be a popular stop. How convenient! This is kiddycorner from the hotel. Right around the corner, a nice pottery display, and a sale. You may have recognized the name on the hotel sign in yesterday's post - that's where some of you will be staying during SF. Here's the lounge. You can see the lobby in yesterday's post. If the hotel hadn't been fully occupied, the staff would have been happy to show us one of the rooms. The people we talked to were exceptionally nice, and we liked the serene vibe and white-glove cleanliness of the public areas. We also checked out several potential SF Friday night reception sites. Gina had suggested this one, and we really liked it alot. More information about the reception will be available soon. And then of course, the Lurie Garden is not to be missed. I expected the Lurie to be bigger than it actually as. Believe it or not, this was the first time I'd ever been there. This is only a small part of the garden - don't worry, it's larger than this! Plants are sprouting everywhere, and the Lurie will look much different in late May. and scilla were blooming when we were there. I'm glad I finally made it down to the Lurie. There's really no excuse not to, since it's a very, very short walk from my train station. I'm looking forward to going back again soon. If I make it back before Spring Fling, I'll share the progress of the garden with you here. I hope you've enjoyed your sneak peak of a few of the sights you'll see here as I report on Spring Fling, and in person if you're one of the lucky ones who gets to come to Chicago in less than two months for the second annual Garden Bloggers' Spring Fling. There will be lots to see in less than two months when Chicago is host to the 2nd annual Garden Blogger's Spring Fling. Probably lots of walking involved even if there's a tour bus. It's been a long, cold, snowy, winter. I didn't keep up with my resolve to stay fit over the winter. Did a lot of walking Friday. Saw a lot of really cool stuff. I knew I should have taken more walks this winter, or worked out in our very convenient exercise room.